Arrowshaft Cavern is a medium-sized cave far east of Bravil containing animals and monsters. 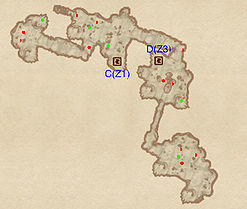 It contains three zones: Arrowshaft Cavern, Lower Arrowshaft Cavern, and Arrowshaft Cavern Subtarrane. This cave contains 52 Cairn Bolete plants and 57 Wisp Stalk plants. You have a 10% chance of meeting an Orc Adventurer here, in Arrowshaft Cavern Subtarrane. 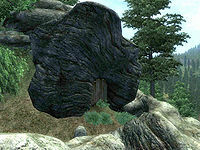 This location's map marker (M on map) is named Arrowshaft Cavern (editor name ArrowshaftCavernMapMarker). The entrance door is SE of the marker, 30 feet away. Arrowshaft Cavern is a fairly linear cave but is worth exploring for the relatively huge amount of treasure. Upon entering from door Out, make your way to the first room, unlock the chest and dispose of the opposition. Continue forward through the tunnel and choose the path to the right in the next room, as it leads to a dead-end with two minor loot chests. Backtrack and pick the other path for two additional chests and follow the southern tunnel to the trapdoor at C, the entrance to Lower Arrowshaft Cavern. 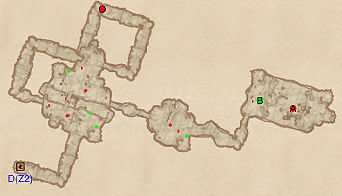 This area is less linear than Arrowshaft Cavern but is easy to navigate. The amount of hostile occupants depends on your luck, but heading west through the two larger rooms will net you three minor loot chests; be careful however, as the monsters can easily group up on you. 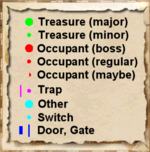 Locate the large tunnel to the east and ignore the trapdoor to the third zone for now, as the last two rooms contain two minor loot chests, one of them locked. Lastly, enter the final zone, Arrowshaft Cavern Subtarrane via the entrance at D.
The Subtarrane is the largest area of the cavern, and is slightly more important as it contains a boss-level chest at location B. The first room is quite large and is guarded by up to four enemies; it contains a pit dividing the two upper levels with a narrow bridge in between. Cross the bridge and loot the chest on the other side, then head east through the tunnel and prepare for a possible encounter with an Orc Adventurer at O. Follow the tunnels all the way to the final room and dispose of the boss leveled monster at A and claim the contents of the chest at B. 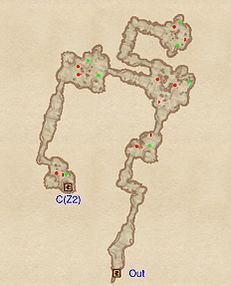 Finally, backtrack all the way to the entrance at D and reenter Lower Arrowshaft Cavern.